When it comes to today’s healthcare, what’s working? Who benefits? At what cost? And under what circumstances? These are the essential questions that health services researchers tackle every day in determining the most effective ways to organize, manage, finance, and deliver high quality care; reduce medical errors; and improve patient safety. As the nation’s largest university-based group of health services researchers, the Institute for Healthcare Policy & Innovation (IHPI) and its more than 470 faculty members are driven to answer these questions through high-impact, collaborative research, and to stimulate change in ways that impact practice and policy. Working with NCRC, IHPI has structured the physical space within its administrative home at the North Campus Research Complex to capitalize on the creativity, productivity, and synergy that the complex exemplifies. IHPI’s footprint of just more than 87,000 net assignable square feet across Buildings 10, 14, and 16 includes formal offices and workstations, along with informal work and meeting spaces. The recently refurbished Collaboratory and Think Tank offer touchdown areas and brainstorming venues to IHPI members, wherever their primary offices may be located. In order to promote research collaboration, a great number of IHPI-affiliated groups have joined the physical space at NCRC over the last few years. Most recently, the Michigan Oncology Quality Consortium relocated from the Comprehensive Cancer Center, and key research groups have expanded their footprints in association with upticks in research awards. IHPI space also includes approximately 14,000 square feet of newly renovated areas in Building 14, allowing the Robert Wood Johnson Clinical Scholars and the new IHPI Clinician Scholars Programs to more fully utilize their offices and learning space, and increasing the efficiency of workspace for a host of research groups. The Center for Bioethics and Social Sciences in Medicine (CBSSM) relocated into a portion of this updated space within Building 14 (from its previous space in Building 16), allowing for additional growth. More than 470 faculty members from 17 U-M Schools, Colleges, and Institutes. Jennifer Waljee, M.D., M.P.H., M.S. IHPI has found early success honing a program of focused career development, scaffolding the entire career arc from undergraduate to established investigator. With a particular focus on early career faculty and cultivating a new generation of health services researchers, IHPI leverages its resources to assist investigators and trainees by investing in training and education programs at a number of levels. To bolster its support of U-M faculty launching careers in health services research, IHPI recently formed the Early Career Faculty Advisory Council (see sidebar), selecting a dozen committed and engaged assistant professors and lecturers who will advise the Institute’s leadership on how it can best deploy resources to serve this growing segment of IHPI’s membership (more than one-third of IHPI’s members are early career faculty). The council provides a venue to develop the leadership and mentorship capabilities of early stage faculty, increase the opportunities for collaboration and intersectional innovation that enrich research portfolios, and create a vibrant environment that will encourage IHPI’s top minds to continue their careers at the University of Michigan. The IHPI Clinician Scholars Program (see sidebar), part of the National Clinician Scholars Program, offers unique clinical and community-based research training through intensive mentorship, designed for clinicians to become change agents driving policy-relevant research and partnerships to improve health and healthcare. Through the National Clinician Scholars Program, the University of Michigan, University of California Los Angeles, University of Pennsylvania, and Yale University, in partnership with the U.S. Department of Veterans Affairs, have teamed up to educate nurses and physicians together to serve as leaders, researchers, and change agents in healthcare, community health and public policy. This program builds on the very successful foundation of the Robert Wood Johnson Foundation (RWJF) Clinical Scholars Program for physicians. U-M has trained RWJF Clinical Scholars since 1995, awarding a master’s degree in health and healthcare research to those who completed the program. This new program expands on the RWJF program by including nursing and pharmacy scientists in addition to physicians, to address new and emerging inter-professional issues related to healthcare delivery and improving the health of communities. 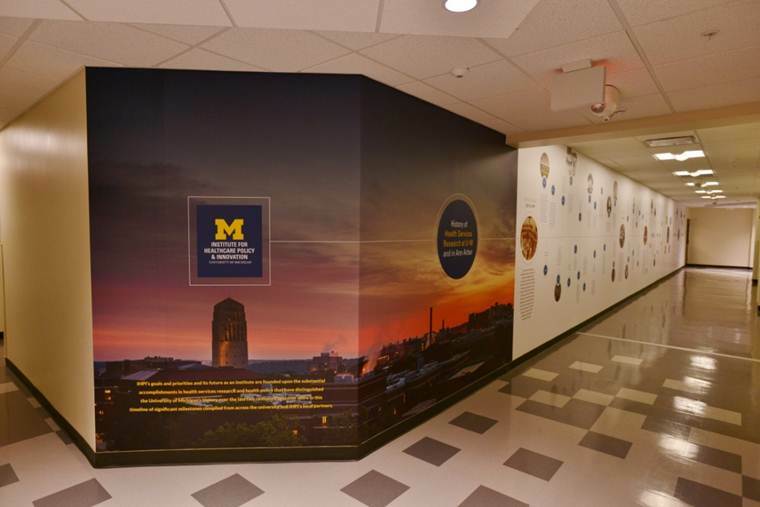 The VA Center for Clinical Management Research, based at the VA Ann Arbor Healthcare System, is also a partner in the U-M program. Other career development opportunities include regular research seminars and methods workshops, an R01 “Bootcamp” in partnership with the Medical School, and K award workshops, in partnership with the Michigan Institute for Clinical & Health Research. And for the second straight year, IHPI is hosting weekly lunch-and-learn sessions during the summer for students working with IHPI faculty, offering students opportunities to learn more about IHPI members’ professional and career experiences. Last year’s program included nine lunch-and-learn sessions attended by an average of 13 students each session, with 19 faculty serving as co-hosts. CBSSM co-directors Brian J. Zikmund-Fisher, PhD, and Raymond De Vries, PhD. As part of IHPI’s efforts to enrich and enhance research activities among its members in support of the Institute’s strategic goals, IHPI’s Data and Methods Hub extends a number of important resources and tools to the IHPI community in the areas of data management and research methodology. These support services focus on improved access to and handling of unique data sets, as well as increased access to thought leaders on research methodology and dissemination of new methodological approaches. The goals of the Data and Methods Hub include helping to build a vigorous and supportive community for IHPI researchers, in order to foster greater professional development, enhance synergies, and continually advance the overall quality of research by IHPI members. IHPI’s data offerings to its members and their research teams include OptumInsight data from 61 million privately insured individuals over a 14-year period, which is currently utilized by 26 separate IHPI projects studying everything from the impact of no-cost contraception on utilization and direct medical expenditures, to predictors of persistent opioid use post-surgery. Other datasets made available through IHPI include Medicare data from 55 million enrollees, as well as the rich data resources of the Health Care Cost Institute (HCCI), currently supporting four IHPI teams of researchers. U-M is one of only seven university-based partners with access to HCCI data, which include information from a number of private insurers on a variety of healthcare encounters by some 50 million people. Ensuring that IHPI members’ work has the greatest possible impact on healthcare policy and practice by promoting evidence-based decision making is one of the major goals of the institute. By framing and sharing IHPI members’ policy-relevant work, the government and external relations function of IHPI’s “Impact Accelerator” raises the visibility of IHPI’s research strengths among policymakers seeking expertise in health services research and health policy. IHPI’s role within the policy arena includes offering tools, training, and consultation to faculty who want to expand the impact of their research, and helping them build relationships through coordinated outreach to state and federal policymakers and other stakeholders. 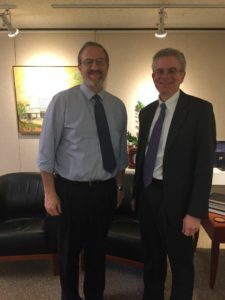 Over the last year, the Impact Accelerator has supported more than 30 IHPI faculty members in interactions with congressional staff members, providing testimony before congressional committees, serving on state task forces for a number of issues, and has also hosted congressional visits on campus. IHPI also provides pathways for its members to participate in policy through many policy organizations outside of government, by building relationships and sharing IHPI expertise and research findings with think tanks, trade associations, and other health organizations and thought leaders. IHPI has secured opportunities for its faculty to participate in briefings, roundtables, and advisory boards, and speaking roles with the Alliance for Health Reform, AcademyHealth, Medicaid Health Plans of America, and Michigan Hospital Association, among others. The National Governors Association recently added IHPI to its short list of experts and consultants for its state Policy Academies and roundtables. Medicare began including antipsychotic use in its nursing home quality rating system earlier this year as a way to reduce use for unwarranted diagnoses, in part because of IHPI research quantifying the magnitude of these drugs’ risk to patients. The U.S. General Accounting Office is also working to reduce the use of antipsychotics in patients with dementia outside of nursing homes. Recently-issued ‘Choosing Wisely’ recommendations from the Society of General Internal Medicine caution physicians against placing PICC lines (an IV device) simply for convenience, reflecting findings from the Michigan Hospital Medicine Safety Consortium (HMS), a Collaborative Quality Initiative including 52 Michigan hospitals supported by Blue Cross Blue Shield of Michigan (BCBSM), which found that up to a quarter of patients who receive IVs may not need them, and may also develop clots or infections as a result. IHPI members Sanjay Saint, M.D., M.P.H., Chief of Medicine at the VA Ann Arbor Healthcare System, and Jennifer Meddings, M.D., M.Sc., assistant professor of internal medicine, published the Ann Arbor Criteria for Urinary Catheter Appropriateness, which helps hospital practitioners choose between three different catheter types, consider non-catheter strategies, and address common bedside challenges that give rise to catheter overuse, which increases patients’ risks of developing urinary tract infections (UTIs). Research from the U-M-led Michigan Bariatric Surgery Collaborative (MBSC), another BCBSM CQI, indicating that the risk of complications is lower when the procedure is performed by a high-volume surgeon in a high-volume hospital has led three major U.S. hospitals, including the University of Michigan Health System, to set minimum-volume standards their surgeons must maintain in order to perform common procedures. Amy Bohnert was appointed Scientific Advisor by Governor Snyder to the state Task Force on Prescription Drug & Opioid Abuse. Julia Adler-Milstein testified on health IT before the U.S. Senate Committee on Health, Education, Labor, and Pensions. Center for Medicare & Medicaid Innovation (CMMI) announces it will implement demonstration projects in Medicare Advantage based on the work of the Center for Value-Based Insurance Design. Many IHPI experts participated in roundtable discussions with U.S. Rep. Debbie Dingell (MI) and U.S. Rep. Tom Price (GA) during their visits to NCRC. IHPI researchers are the lead evaluators of Michigan’s Medicaid expansion. This team’s work is providing valuable information for state and national policymakers as well as enriching the national discussion about healthcare reform. 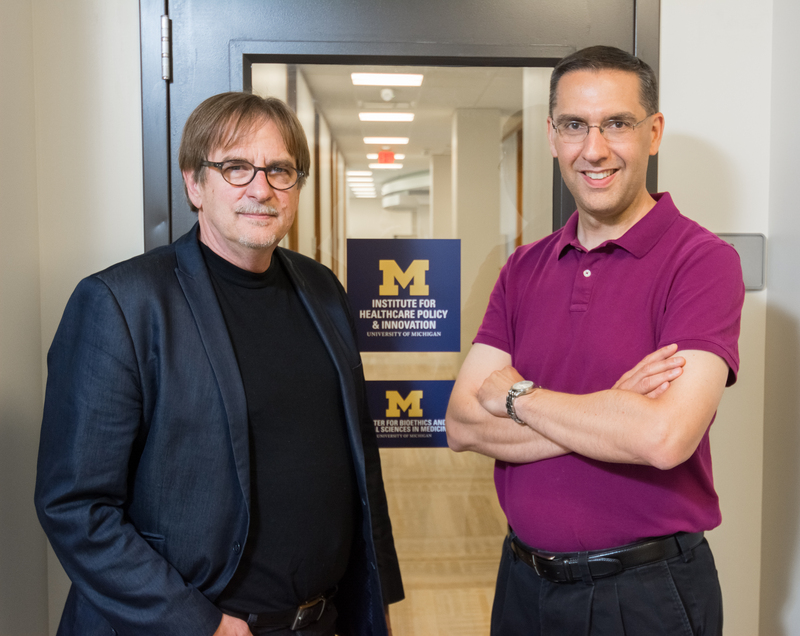 IHPI has assembled an interdisciplinary team of 17 University of Michigan faculty members across multiple schools and departments, and is working with the Michigan Department of Health and Human Services to provide periodic evaluation finding over the next three years. 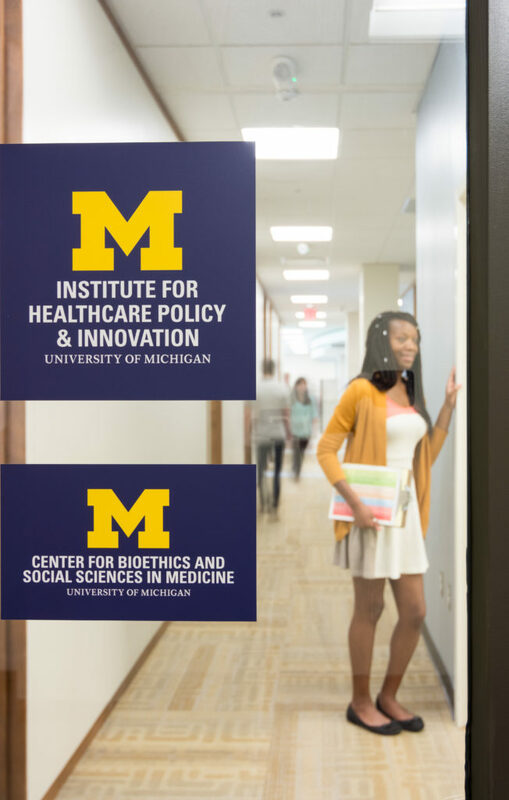 IHPI’s goals and priorities, and its future as an institute, are founded upon the substantial achievements in health services research and health policy that have distinguished the University of Michigan over the last two centuries. 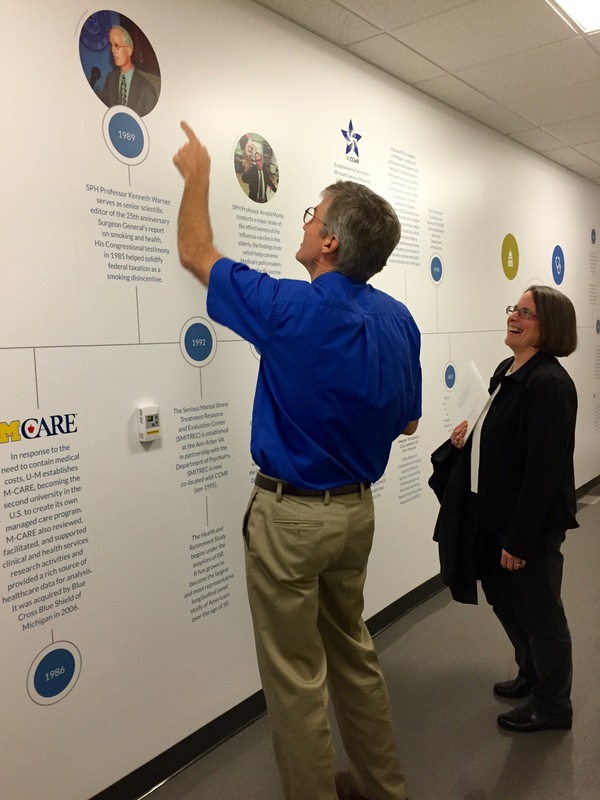 As a way of honoring that history, last year the Institute compiled an interactive online timeline of significant milestones achieved across U-M, as well as by IHPI’s local partners, and also installed a 70-foot-long version on the ground floor hallway between NCRC Buildings 10 and 14. This year IHPI launched a “Strategic Initiatives Catalyst” to help identify, evaluate, prioritize and launch signature projects aligned with IHPI’s strategic priorities in research and education/training. The Catalyst will play an essential role at IHPI by vetting opportunities for important and significant initiatives, bringing members together for effective collaborations, and propelling successful ideas into implementation. The Healthy Michigan Plan evaluation is an example of one such initiative well into implementation, and a new collaborative initiative to improve opioid prescribing in Michigan hospitals is preparing to launch this fall. IHPI marked the fifth anniversary of its approval by the U-M Board of Regents on May 19, 2016, and looks toward its next five years, and beyond, with renewed enthusiasm for innovative opportunities to tackle current and future healthcare challenges. As IHPI looks forward to celebrating the University’s bicentennial in 2017, the Institute will continue to build on U-M’s storied accomplishments by expanding its contributions to health services research, health professional education, and health policy.